A prestigious food guide has allowed a top French restaurant to publicly withdraw from its listings. 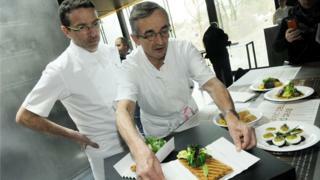 Sebastien Bras's Le Suquet restaurant in southern France held Michelin's three-star rating for 18 years. He shocked the food world in September when he decided to give up his top rating, saying he no longer wanted to cook under the "huge pressure" of being judged by its inspectors. It is the first time Michelin has ever allowed a restaurant to bow out. "It is difficult for us to have a restaurant in the guide which does not wish to be in it," Michelin spokesperson Claire Dorland Clauzel told AFP news agency. She said other restaurants had dropped out when chefs retired or the concept had changed. What did Mr Bras say exactly? The gastronomic bible's decision comes after Mr Bras, 46, spoke out about no longer being able to deal with knowing that just one below-par dish could jeopardise his reputation. "You're inspected two or three times a year, you never know when," he told AFP. "Every meal that goes out could be inspected. That means that every day one of the 500 meals that leaves the kitchen could be judged." What does it take to win a Michelin star? Mr Bras's famed restaurant in Laguiole will not be featured in the 2018 edition of the Michelin guide to be published next Monday. What does it take to reach star quality? Originally published in 1900 to guide French motorists to find food and lodging on the road, the Michelin guide is now exclusively dedicated to fine dining. To be in for a chance of one of the coveted stars, restaurants first have to be in a region Michelin covers. In 2016, it made history by releasing its first-ever Singapore edition, in which it awarded stars to street stalls for the first time. Researchers for the secretive organisation whittle down the best-reviewed restaurants by food bloggers and critics, and only after scouts draft a shortlist, do inspectors make anonymous visits to evaluate the food. One Michelin star represents a "very good restaurant in its category", while two stars denotes a restaurant boasting "excellent cooking" that is "worth a detour". Three stars, however, is the ultimate honour, afforded only to those restaurants that offer "exceptional cuisine" that is "worth a special journey". How great is the pressure on top chefs? It is not clear what the exact recipe is to receive a recommendation or star - but chefs have been chasing these accolades for decades. Currently, 27 French restaurants are in the elite club of holding Michelin's maximum three-star rating. Mr Bras, who took over his three-star restaurant from his father Michel Bras almost a decade ago, accepts that by relinquishing his stars, "maybe I will be less famous". Le Suquet was dubbed "spellbinding" by Michelin's guide and currently commands a price of up to €230 (£202; $285) for its fixed menus. Its chef says he is keen to "start a new chapter" in his restaurant's history, away from the ultra-competitive world of Michelin-star cooking. He hopes he will soon be able to present tantalising dishes "without wondering whether my creations will appeal to [the] inspectors". He confessed that, like "all chefs", he sometimes thought of fellow Frenchman Bernard Loiseau, who took his own life in 2003. Mr Loiseau took 10 years to achieve three stars and his death was widely linked to rumours that he would lose his third Michelin star. In 2005, the late Alain Senderens said he'd had enough of the agony of perfection and closed his three-star Art Nouveau Paris restaurant. He is quoted as saying he wanted to do "beautiful cuisine without all the tra-la-la and chichi"
Finally, Danish chef Rene Redzepi forfeited the two stars he won for his Noma restaurant last year. He closed the eatery in order to move it to another part of Copenhagen, saying it was "necessary to break down a castle in order to build a new one"
Star quality: What does it take to win the Michelin award?